When you lose your dog every second counts. So what if there was a way to activate an army of scouts in the exact area your dog was last seen, with just the push of a button? Well, that’s PEDIGREE Found. You just register your dog for piece of mind, and if they go missing you just press the LOST button. This creates lost dog alert mobile ads in the area your dog was last seen instantly, geo-targeted to a pinpoint radius of 2.5 kilometers & personalized with your dogs information. This, along with notifications to all Found app users, gives our network of eyes all the details they need to bring your dog home safely, and quickly. To create Found, Pedigree and Google invented a revolutionary new system to push out dynamic, location specific display media in a matter of seconds – down from up to 30 minutes. 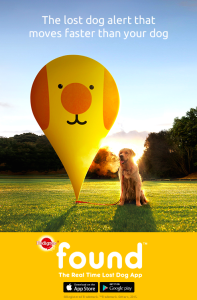 So now, thanks to FOUND, your dog won’t stay lost for long.